TORONTO (June 14, 2011) – NABA Lightweight Champion Logan Cotton McGuinness defends his title for the first time June 24th in the 10-round main event against Daniel “Canerito” Ruiz, headlining “Friday Night At The Fights,” at Hershey Centre in Mississauga, Ontario, Canada. Hot, unbeaten prospect McGuinness (14-0-1, 7 KOs), rated No. 11 by the WBA, will be fighting at home where he won the NABA belt this past February, stopping veteran Hector Julio Avila (47-5) in the fourth round. Ruiz (22-3-1, 16 KOs) will be fighting outside of his native Mexico for the first time. He is undefeated in his last five fights with four wins and a draw. 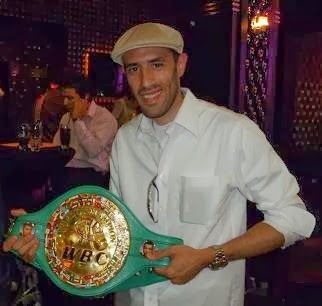 He is the former Mexican Pacific Coast Featherweight Champion. Two-time Canadian Olympian and world title cruiserweight challenger, Troy Ross (24-2, 16 KOs), fights an opponent to soon be determined in an eight-round Special Feature. Ross is the top-rated IBF contender at No. 3 (#1 and #2 are not rated), as well as ranked No. 5 by The Ring magazine, No. 14 by the WBA, and No. 15 by the WBC. Go on line at www.HennessySports.com for more information about McGuinness’ June 24th title defense.